Japan’s long-serving emperor, Akihito, stunned his country Monday in a video address, during he heavily hinted that the Japanese parliament should consider permitting his future abdication. The emperor did not fully endorse legislation to allow abdication, out of respect for the tradition that emperors do not intervene directly in Japanese politics. But at age 82, Akihito, who has suffered from increasingly poor health in recent years, made it abundantly clear that he believes that his retirement would be a good thing for the Japanese people — if the current government finds a way to amend the imperial succession laws. In addressing the Japanese people directly, and in reinforcing the emperor’s role as a symbol of postwar pacifism, Akihito also contrasted with the post-imperial views of prime minister Shinzō Abe, perhaps the most nationalist of Japan’s postwar civilian leaders. No matter what happens, Akihito’s address signals that his son, the 56-year-old Naruhito, could take a much more high-profile role in the future. 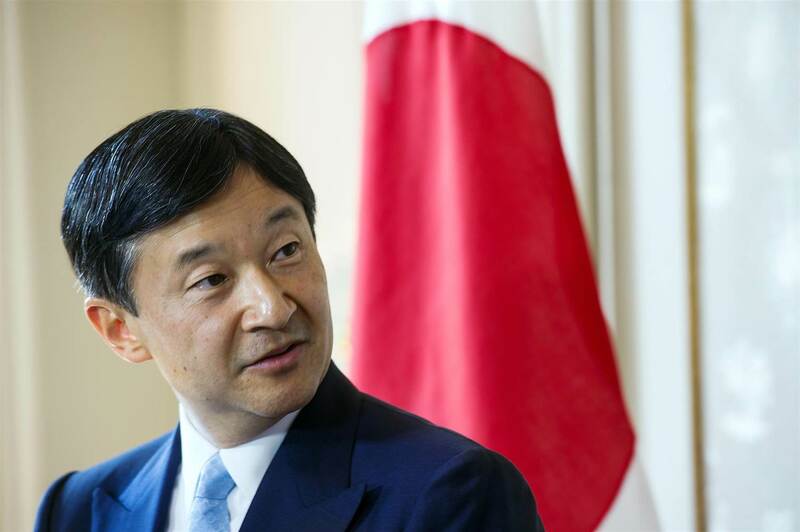 If the Diet enacts legislation permitting abdication, Naruhito might even soon become Japan’s new emperor. The abdication question is now just one of several issues on Abe’s desk after his dominant Liberal Democratic Party of Japan (LDP, or 自由民主党, Jiyū-Minshutō) made gains in elections last month in the House of Councillors, the upper house of the National Diet (国会, Kokkai), the Japanese parliament. Among other things, Abe has postponed a long-planned increase in the national consumption tax and has doubled down on what’s already been nearly four years of fiscal and monetary stimulus to improve Japan’s long-stagnant economy. Above all, he still harbors dreams of revising Japan’s pacifist constitution by amending Article 9, the famous provision that outlaws war and technically forbids a standing Japanese army (though, in reality, the so-called Japan Self-Defense Forces have more personnel than the United Kingdom’s army). Akihito’s Monday afternoon address, however, brings the Japanese imperial tradition to the forefront of Japan’s often muted (by American standards, at least) political agenda. The Chrysanthemum Throne dates back nearly three millennia as the world’s oldest continuing hereditary monarchy. Japan’s emperors, however, traditionally wielded more moral and spiritual power than actual power. That was true in the Tokugawa era, and it’s been true since the end of World War II when the United States and its allies rehabilitated the imperial institution to use Hirohito, who reigned from 1926 to 1989, as a link from pre-war to post-war Japan. 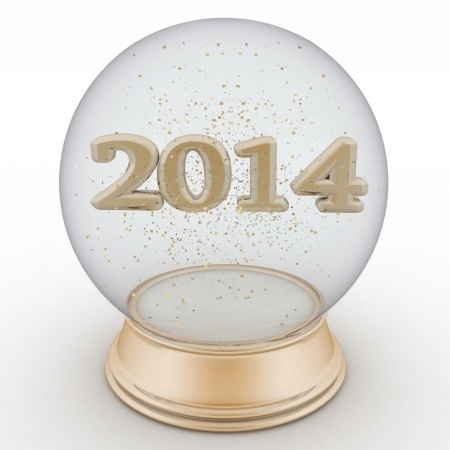 Will we think of the postwar era as the ‘New Elizabethan’ era? Photo credit to Chris Levine. 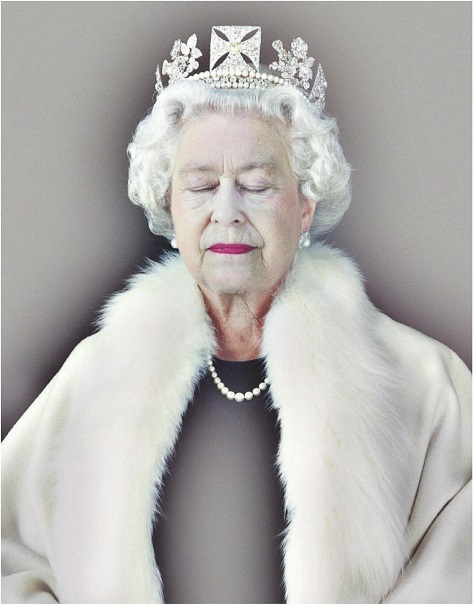 Today, Elizabeth II became the longest reigning monarch in British (or English) history. At the beginning of her 63-year reign, which today officially exceeded that of another queen, Victoria, Winston Churchill was prime minister of the United Kingdom, former prime minister Clement Atlee was still leader of the Labour Party and Harry Truman was just entering the final year of his presidency in the United States. India was enjoying the fifth anniversary of its formal independence from Great Britain and some countries, like Belize, Uganda, Nigeria and Kenya, were still British colonies. The Soviet Union’s Joseph Stalin was still alive (though would die in just over a year), and the Cold War would sludge on for another 38 years. Mao Zedong would have nearly a quarter-century ahead of him as the ruler of Communist China. 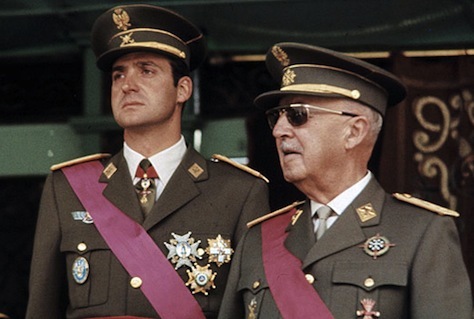 Charles de Gaulle was still six years away from founding France’s Fifth Republic, and the European Economic Community, the forerunner of today’s European Union, would not be formed until the 1957 Treaty of Rome — and it would be another 20 years before the United Kingdom would be permitted to join the EEC, over two of de Gaulle’s vetoes. As of today, at least, the halfway point of Elizabeth’s reign is in 1984, when British prime minister Margaret Thatcher was still in her second term and US president Ronald Reagan had yet to win reelection. US basketball player Michael Jordan had just been drafted by the Chicago Bulls, and the world had never heard of Mariah Carey, Jay-Z, 2Pac, Britney Spears or Green Day. Consider this: Diana, who married Elizabeth’s first son, Charles, the Prince of Wales, was a princess for only around one-fourth of Elizabeth’s reign — from her marriage to Charles in 1981 to her untimely Paris death in 1997. (But note that the British monarchy’s lowest point, in the second Elizabethan era, came in the early hours following Diana’s death — and that the media-savvy perspective of former prime minister Tony Blair, along with the saccharine ‘cool Britannia’ sugar high of New Labour’s first term, did much to restore the monarchy’s luster). The very presence of Elizabeth Alexandra Mary of the House of Windsor is so staggering because, for more than 63 years, she has been such a reassuringly stolid face of the British monarchy that she is now the living embodiment of both what it means to be British and what it means to be a monarch. That’s not hyperbole. Of the 39 countries in the world that use monarchies (constitutional or otherwise), Elizabeth is the head of state for 16* of them! 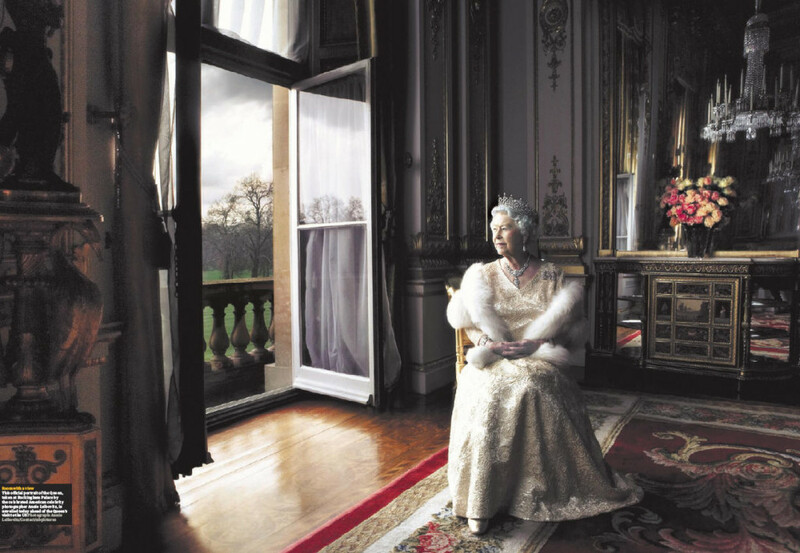 All of which is a long way of saying that here in the year 2015, one way to think about the postwar era is simply to think of the age of Elizabeth — the new Elizabethan era. 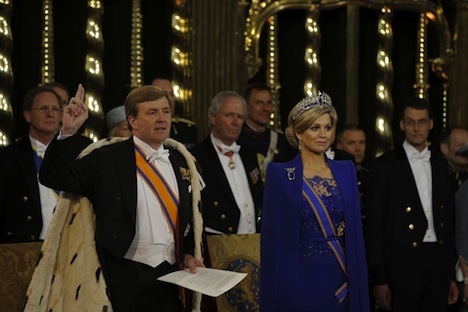 Are constitutional monarchies better than presidential republics? Correlation ≠ causation! Like most folks who have no really strong feelings about the British monarchy (I’m neither incredibly pro-monarchy or anti-monarchy as far as constitutional monarchies go these days), I spent much of the past two days avoiding the coverage surrounding the birth of the royal prince born Monday to Prince William and Kate Middleton. Constitutional monarchy is the best form of government that humanity has yet tried. It has yielded rich, healthy nations whose regime transitions are almost always due to elections and whose heads of state are capable of being truly apolitical. The U.S. would do well to adopt it. The key to monarchs’ success is that they’re totally illegitimate. The people wouldn’t stand for Queen Elizabeth exercising real political power just because of who her father was. That’s a powerful deterrent that prevents monarchs from meddling in political affairs. 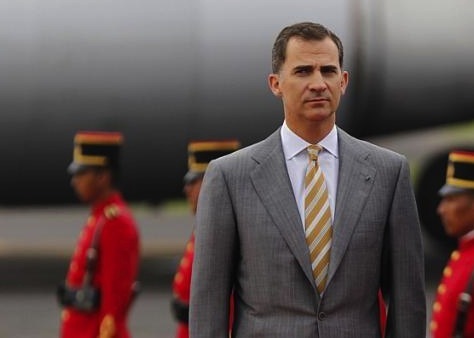 The result is that in all but very rare cases, prime ministers in monarchies are never thrown out of office except when they call elections or when they receive a vote of no confidence in parliament. The head of state can’t touch them. It’s an interesting thesis, but I’m not sure that it holds up nearly as well as Matthews thinks it does. There are a lot of historical and economic reasons that explain why constitutional monarchies, which are predominantly located in Europe, are so much richer and healthier. North America and Europe are, well, richer than Africa or the Middle East or South America, in general terms, but it seems like ‘having a constitutional monarchy’ is not incredibly high on the list of reasons why Europe’s standard of living is so much higher than Africa’s. The legacy of colonialism, for one. 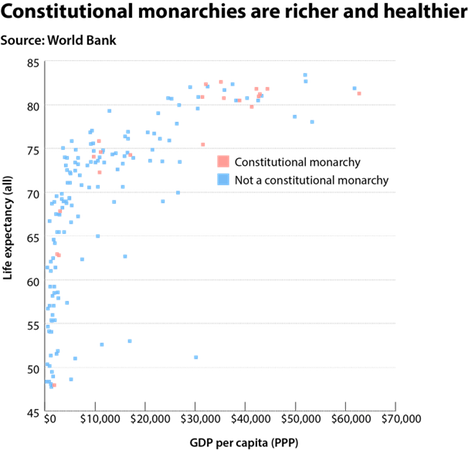 Still, the chart that states ‘constitutional monarchies are richer and healthier’ is not subtle, and I’m sure Matthews doesn’t mean to argue that Nicaragua or Paraguay or Kyrgyzstan would today have a GDP per capita of $40,000 if only they had introduced monarchies a century ago. Nor do I believe Matthews would defend the absolute monarchy of Swaziland, which boasts the world’s highest HIV/AIDS rate and where GDP per capita routinely falls even below that of neighboring South Africa. Is Swaziland better off today from the benevolence of King Mswati III? I don’t find that argument credible. Opponents of constitutional monarchy often point to this as their preferred alternative. The British group Republic supports abolishing the monarchy and replacing it with a directly elected president, and estimates that the British royal family costs almost ten times as much as the German president. So why not just do that, then? And that’s just not true. There’s no theorem of international relations that requires a parliamentary system to have a separate head of state. Matthews notes that only the sultans of Brunei and Oman simultaneously serve as prime minister. But in the United States, the president also essentially serves as the simultaneous head of state and head of government (unless you’d like to argue that John Boehner, speaker of the U.S. House of Representatives, or Harry Reid, the U.S. Senate majority leader, are the heads of government, though I think it would be a difficult argument). In any event, even if we don’t particularly prefer the Bruneian or Omanese models, it doesn’t mean that it’s a bad model from an abstract governance standpoint.